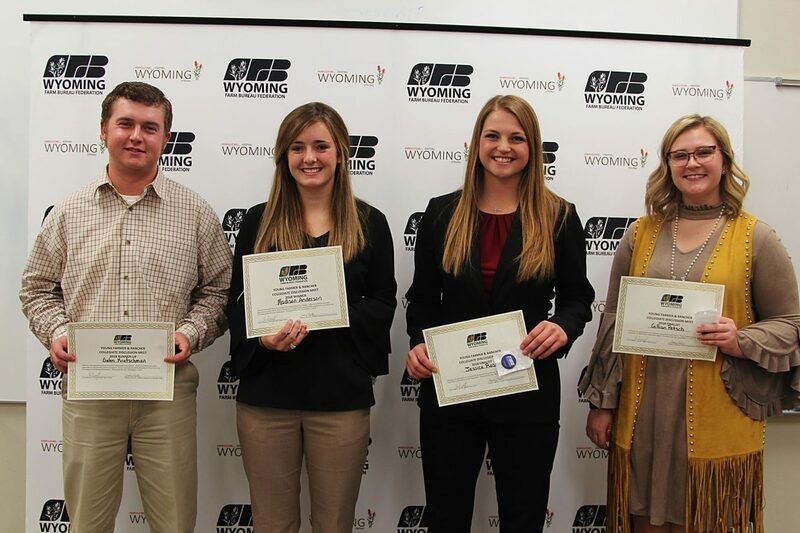 The final four finalists in the 2018 Wyoming Farm Bureau Federation Young Farmer & Rancher Collegiate Discussion Meet held at Sheridan College. From, left to right. Galen Kretschman, Sheridan College; Madison Anderson, Sheridan College; Jessica Rossi, University of Wyoming; and Gillian Petsch, Sheridan College. Sheridan College student Madison Anderson discussed agriculture issues at the Wyoming Farm Bureau Young Farmer & Rancher Collegiate Discussion Meet and earned $300 cash and an expense-paid trip to Milwaukee, Wis. Anderson competed Nov. 7 in Sheridan, Wyo. Seven competitors representing Sheridan College and the University of Wyoming entered the competition. The competition is designed to simulate a committee meeting where discussion and active participation are expected. Galen Kretschman, Sheridan College student, was named the runner-up and was awarded a $150 cash prize. A fourth-generation rancher from Arvada, Wyo., Kretschman is studying agriculture business. Rounding out the final four finalists were: Jessica Rossi, University of Wyoming and Gillian Petsch, Sheridan College. Rossi is a senior studying agriculture business. She also serves as the Collegiate Farm Bureau Chapter Chair at UW. Petsch is from Meriden and is studying agriculture business and communications. Contestants are given pre-determined topics. They are judged on their knowledge, speaking ability, ability to participate in a committee meeting and listen to others and air all points of view. All contestants competed in two rounds of competition. The top four advanced to the final four round. “We will be cheering Madison on as she heads to Milwaukee representing Wyoming Farm Bureau next March,” Kortes concluded. 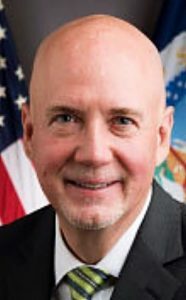 Anderson will represent the Wyoming Farm Bureau in the American Farm Bureau Federation Collegiate Discussion Meet March 15-18, 2019, in Milwaukee, Wis. Anderson grew up on a ranch in Ten Sleep, Wyo. She is studying agriculture business at Sheridan College. FFA has played a large part in her agriculture involvement.